Square is a mobile payment processing system that provides small business owners with the opportunity to accept credit card payments through unconventional means unlike the traditional way of accepting payments through small devices that most of us do not even know the name of anymore. Square is a Register app that allows small business owners who own stores, whether they are retail or food-based, restaurants etc. to accept payments on the go. Square was created by one of the founders of Twitter, Jack Dorsey, and it gives small business owners and vendors the ability to bring their business to markets, different states or countries where so they can accept mobile payments no matter where their business is on a given day. Square has really paved the way for companies that have come after it since it was founded in 2009 and has grown to have several mission followers and annual payments amounting to over $10 billion. Square’s tagline is that it works for every business and this is something that they really pride themselves on. Their latest features allow vendors to accepts NFC payments. Square also has a product called Square Stand which is a stand for vendors to put in shops that has the square logo on it, making it easy for users to sell through square. Fees are the same for all credit cards – Visa, Mastercard, Discover, American Express – and deposits are seen the next day. Fees run at 2.75% per swipe, dip or tap and at 3.5% + 15 cents for every keyed in transaction. Customer service allows for chargeback protection and payment dispute solutions. Square Point of Sale allows for small business owners to analyze the current state of their sale and the future potential of their business by allowing for the ability to track sales and manage all areas of your business. Refunds, taxes, tipping and discounts are offered through Square’s POS services as are direct customer feedback, digital and printed receipts, invoices and recurring payments, real-time inventory management. The software that developers have created for the Square Point of Sale App allows small business owners to use it as a mobile POS application on a smartphone or on a tablet on a given computer. The technology of the Square app is constantly improving. Because of the success of the Square app over the years since its inception, the truth is that they have been able to employ developers of great talent to continuously improve their product. Square POS software is impressive, but their hardware department is impressive as they offer options like the Square Stand mentioned early in addition to custom POS kits that can be hand catered for any small business. The Magstripe reader allows for businesses to utilize the Square Reader with the free Square Point of Sale app to allow businesses to accept payments on their smartphone or tablet. The square reader plugs directly into the headphone jack on your computer. Square’s point of sale capabilities certainly keep it in the game as a top player within the businesses which accept mobile sales. Square is a great platform for POS payments for businesses like restaurants, bakeries, retail stores, artists and other small business vendors that require taking payments on the go in their main place of business or at markets. Being the maverick of the POS payments system, Square definitely has advantages as they are the veteran of the POS payments systems and mobile payments revolution that is taking place as technology continues to change the lanscape of receiving financial income for small businesses in the twenty-first century. There have been a lot of alternatives that have come out as competitors to Square and they are being built by moguls in the tech industry. Some of the new applications and payment services are Intuit GoPayment (also the founders of TurboTax – the popular website many small business owners use to file personal and business taxes; and Mint: the application that groups and categorizes spending through the free application), Inner Fence, Spark Pay, PayPal Here (founders of the successful PayPal Business, iZettle, Paymentio.com, Handpoint and Inexpensive. All of these different applications offer different positives while all of course come negatives and these are all important factors to assess when you come to the point of choosing which application to use for your small business and what is best for you as a vendor. 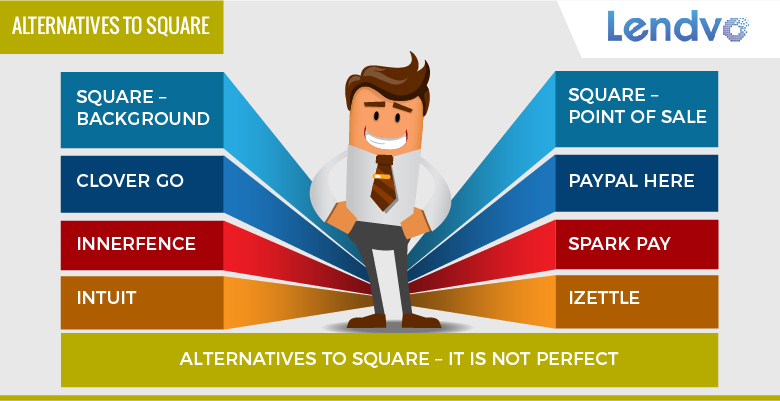 Certain reviews of Square have actually been negative, such as accounts of customers claiming that they do not offer the best customer service when significant problems arise with the Square POS system. Intuit’s Point of Sale technology is one of the great alternatives ot Square as they offer a one-stop system to assist with sales for any given small business’s need, the acceptance of credit cards, the ability to manage vendors and inventory. The beauty of using a Point of Sale system for a company like Intuit which is already associated with QuickBooks is that you can circulate your data from any sale or any other business activity that takes place on the POS platform to your QuickBooks Desktop. As their technology has improved, they now also offer auto payment reconciliation with no fear of double entries. Intuit also offers no rates and flexibility with long-term contracts while accepting credit cards and debit cared for its customers and integrating this data onto their QuickBooks desktop platform. The integration with Quickbooks comes with a very reputable protection system. Their iPad Point of Sale services have their own email address which can be contacted at [email protected] in addition to a telephone number with customer service available for help 6am-8pm PST Mon-Fri and 7am-4pm PST Sat-Sun. The technology currently runs at a rate ten times faster than the version before it and allows you to multi-task with tasks on your POS system software. The technology comes EMV ready and is designed to support the most updated payment technology as it comes along. Clover is another option which is sold by banks to its customers. Clover Go is a good option because it is compatabile with businesses that use chip/pin to make sales in addition to businesses that use the magstrip to make deals. The rates are a bit higher for transactions that require a key-in and these charge you per transaction at a rate of $0.15. The actual rate is 3.5% while transactions that do noy require a key-in are 2.7%. CloverGo is compatible with smartphones like iPhones and Androids. Clover Go is EMV-compliant with the correct headphone jack rcard reader and the numbers and costs vary depending on the reseller. Clover Go is a real merchant account. Clover Go mobile also is part of its parent program which has customizable tax initiatives, email and SMS receipts and state-of-the-art inventory management software allowing customers the ability to have a wider arry of options in some aspects of the POS business in comparison to Square. The Merchant Services account has a payment structure known for its interchange-plus pricing system which has rates of 0.25% and $0.10. The monthly fee is $25 and the app charges customers $10 for usage by Clover. Clover Go prides itself on being a safe and customer-friendly option for customers to accept payments on the go by simply swiping the back of their phone with the credit card showing up on the interface of the phone to transmit the data needed to complete the charge from customer to business. The all-in-one reader allows for contactless, chip and swipe card payments with Apple Pay products, Samsung Pay and Android Pay so it is user-friendly with most of the common smartphone devices. Using EMV chip cards will help to reduce fraudulent activity. The Clover Security data protection allows for the unique real merchant account which is good, but the user must use First Data as the processor which is really the only place Clover Go does not allow for great flexibility. On the bright side, the Clover web dashboard allows you to manage business no matter where you may be as long as you have internet connection and customer service is available 24/7. Clover Go permissions are also allows to be added by small business owners for their employees. PayPal Here is owned by the PayPal conglomerate and PayPal Here, known as PPH is a commonly used mobile processing Point of Sale system as an alternative to Square. PayPal Here accepts payments with keyed in credit cards or swiped credit cards in addition to utilizing the smartphone’s camera with image capture to deposit checks directly through PayPal payments. PayPal Payments, the parent website and business, to PayPal Here is a very popular website and application that is compatible with Android, Windows and Apple devices. Mobile POS, mobile card processing and the free audio jack swiper are all available on PPH. PayPal here is highly regarded in the industry because of its technological capabilities and the extensive array of features it ovvers as a business. The user interface is extremely comparable to Square because of PayPal’s extensive knowledge and capabilities as a company. PayPal Here operates through PayPal’s main support system and they can be dontacted any time Monday through Friday between 9 AM and 5 PM Central Time. Alternatively, customer service answers questions on Twitter at the @AskPayPal handle. Testimonials have reviewed PayPal Here’s customer service on a higher level than Square in many instances and this may be additional reasoning for some small business owners to opt to select PayPal Here as their POS source. Android and Windows are compatible with PayPal Payments as are Apple devices. You can acquire funds from your PayPal account immediately through PayPal Here once you request them. The charge rate comes in at 2.7% per US swipe transaction for small business owners that use PayPal Here to accept any form of payment for the sale of their product. The other pricing comes in at 3.5% and 0.15% for key in cards. The invoice costs are 2.9$ and $0.30 per invoice and for making deals border-to-border the fee is 1.5%. PayPal Here accepts all payment types and allows you to accept credit and debit cards instantly in addition to sending invoices which allows you to get paid later based on the needs of the customer and the small business owner. PayPal Here is one of the best alternatives to Square and should be taken into high consideration for all business owners. Spark Pay is a Point of Sale mobile payment system that was created by Capital One and serves the industry as a sleek, highly powered e-commerce business system. The cloud software that is products for small businesses by Spark Bay to organize and digitize any given small business and process payments is state-of-the-art and their payment offerings that begin with a free account and free mobile reader are tempting when compares to square and other POS systems. The Pro Plan comes in at a 1.99% rate costing business owners $19 per month with $0.05 transaction fees. This plan includes no additional fees and different rates depending on the credit card or keyed in transaction. The keyed in transaction is 2.80%. The free Spark Pay mobile reader comes with this plan and credit card rates are Visa at 1.99%, MasterCard at 1.99%, Discover at 1.99%, American Express priced at 2.80%. The Go plan is the other plan offered by the Spark Pay service and the rate is 2.65% with the keyed in transaction fees at 3.70%, the American Express rate at 3.70%, the Discover rate at 2.65%, the MasterCard at 2.65%, the Visa at 2.65% and a fee per transaction at $0.50 for all fees, but the catch-22 here is that there is no monthly fee. The setup is similar to square for Go with no commitment or monthly charge but it is a bit more expensive than Square. The customer service number for Spark Pay is 1-877-231-7547 if you are a small business owner interested in learning more on the service. iZettle is another Point of Sale service that is based in numerous countries outside of the United States including Germany, Spain, Mexio, the UK, Denmark, Sweden, Norway, Finland and Brazil. These merchants are supported by the chip card-based mobile payment service that iZettle uses. iZettle prices itself on allowing for multiple staff accounts, its utilization of cash and card acceptance for payments, online reporting tools that are technologically advanced, its inventory library, cash drawer and receipt printer connectivity allowing receipts to be sent by mail and its great customer service. iZettle offers email support in addition to phone support on weekday business hours and testimonials for iZettle have been extremely high based on message boards and commentary throughout the internet. iZettle is also a highly cost-effective service. It is a good option to consider for businesses conducting a high volume of business. iZettle had a huge fundraising round that ending at the beginning of 2017 which allowed them to raise another $63 million and the company to be valued at $500M. This can only mean that the Board of Directors and executives of the company are looking to expand business and one must think that the United States is next on their radar as the United States has the most Point of Sale based businesses of any country in the world which is to no surprise. The company is swetich and the tablet works with smartphones and tablets. Inner Fence is another Point of Sale business and was actually the first to enter the mobilce processing app space. The irony is that InnerFence uses the Strip technology to accept payments and their rates come in much higher at $39 per month with a 2.9% billing rate and charges of $0.30 per transaction. Once you become a customer to InnerFence you receive a free card reader and additional ones cost $79. Existing merchant accounts can be linkes to InnerFence. InnerFence allows its merchants to have their own account as opposed to a company like Square which requires its customers to share their business and conductivity in the POS merchant space with other merchants. InnerFence has received praise from its customers and within the technology over the years and there is certainly something to be said for the fact that they were the first to develop the POS system for mobile payments and pave the way for the groundbreaking technology that is changing the way vendors, restaurants, retail stores, technology companies, sports arenas and many other billion dollar industries conduct business on a daily, monthly and yearly basis. The company was founded in Seattle by Derek Conte and Ryan Johnson and they are usable for anyone with a smart device, although they were initially founded for the use on apple devices. They can be reached at 1-800-895-4085 and at the email address of [email protected]. The website is www.innerfence.com for the apple based platform.